QR codes, also known as Quick Response Codes, are often used to provide quick access to different types of web content. Nowadays, the use of these codes has become so rampant that almost everybody wants to create their own. Luckily, these types of codes aren’t difficult to create. All you need is a good and secure QR code generator. Through the help of a QR code generator, you can easily generate codes that would instantly direct other people to your Facebook page, website, blog and even to your YouTube channel. If you still haven’t tried creating one, you better check out this free web app called Kaywa. What is Kaywa? 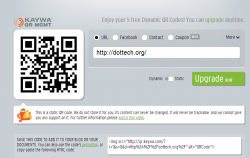 It is basically a free online QR code generator that you can use to generate a wide variety of dynamic and static QR codes. Through this web app, you can easily create QR codes for your social network profiles, websites, blogs, etc. You can even create a special code that will contain your contact information and then you can attach this code to your business card. While you’re allowed to use this web app without creating an account, it would still be best for you to register for a free account. To generate a code, just log-in to your Kaywa account and then you select the type of QR code that you want to create. If it’s a code for a specific website URL, then you need to provide the actual URL. Once you’re done setting up the content that you want to put into your code, simply click the “Generate” button. After which, the web app will automatically generate your code and you can download your code as PNG or PDF. The rest is up to you. You can share your code via email, IM or SNS. You can also print your code on different items such as your wallet, bag or pillow. Easy to use, accessible – no need to install any software. Just load the web app on your web browser and you’re all set to create a new code. Can create QR codes for links, Facebook profiles, contact information, coupons, phone number, mobile number and SMS – you can also use custom texts such as a simple greeting or quote. You can write whatever you want for as long as it goes within the limit of 160 characters. 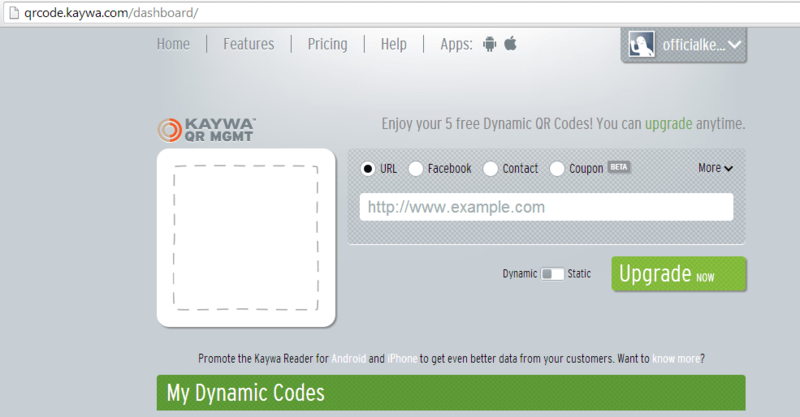 Can generate dynamic and static codes – Free Kaywa account users are allowed to generate up to five dynamic QR codes. There’s no limit to the amount of static codes that you can generate. You can download your Dynamic codes as PNG or PDF. You can also embed your codes to your website or blog. For static codes, you can save the image as PNG or you can directly share its URL. Kaywa won’t store your static codes. It will only store a copy of your dynamic codes. Majority of the web app’s features are only available to paid users. So if you’re a free user, your choices are very limited. Did you know that there are tons of things that you can do with your own QR code? First and foremost, you can use a QR code to share you contact information to other people. So instead of writing your mobile number on a piece of paper, just ask your friend or acquaintance to scan your code. If you’re the creative type, then you can promote your products and services by posting your QR codes on different media channels. This is why you should at least consider using a reliable and secure QR code generator. Needless to say, the web is filled with QR code generators. Some of them are available for free while there are also those that you can use in exchange for a decent subscription fee. As for Kaywa, it has both free and paid packages. So you’re free to choose whether to stay as a free user or to pay for a monthly subscription which usually ranges from $13.75 per month to $110 per month. Anyways, the focus of this review is the free subscription plan. This plan will basically allow you to generate a maximum of 5 dynamic QR codes. These are the types of codes that you can edit and update whenever you want. Even if the amount of dynamic codes that you can generate is limited, there is no limit to the number of static codes that you can create. The downside to this option is that you cannot store the codes to your account. Another notable downside of this web app is that it doesn’t allow you to customize and shorten your QR code’s URL. On a positive note, Kaywa features a user-friendly interface that lets you generate codes in seconds. You’re also free to create the codes that you want and once you’ve generated a code, it will be yours forever. You can use it anytime without any restrictions. I like using Kaywa because it’s easy to use plus it’s very accessible. There’s no need for you to download and install anything so it is very convenient. It’s free version may have a lot of restricted features but it is good enough especially if you are not using it on a daily basis. What’s also great about this web app is that it doesn’t limit the type of QR codes that you can generate. You can generate codes for landing pages, social profiles, products, coupons, etc.